Oakland Cemetery and Mausoleum is Freeport's premier cemetery service provider. We are mothers, fathers, sisters, and brothers of the Freeport and surrounding communities that we so proudly serve and we dedicate ourselves to providing exceptional services to the families in these communities. Oakland Cemetery and Mausoleum is very pleased to announce the unveiling of a new memorial dedicated to all servicemen and women that have served in defense of our great nation. 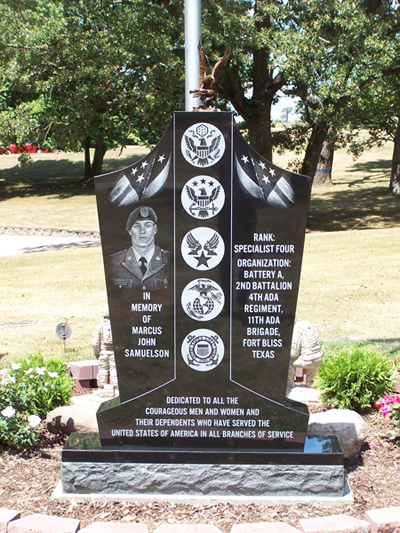 The memorial was dedicated on August 23rd in a special ceremony honoring U.S. Army Specialist Marcus John Samuelson. Specialist Samuelson died in November 2011 while stationed at Fort Bliss in E Paso, TX.